Monrovia – Efforts to ensure transitional justice measures in Liberia are garnering international attention and hope among those who long for justice for war crimes is reignited as an increased number of alleged Liberian war criminals are prosecuted abroad. While the international community and Liberian activists will gather in a momentous conference to discuss opportunities for justice in Liberia, Civitas Maxima, the Global Justice and Research Project (GJRP) and Flomo Theater are partnering to conduct two important events that reach out to the youth, the victims, and the artists. Moreover, Civitas Maxima and the GJRP, in partnership with the Liberian Visual Arts Academy, are organizing an artistic Youth Conference. The “Justice in Action” project seeks to portray the narratives of war, the various memories, and the experiences of those who survived while supporting dialogue regarding the way forward. On the 5th of November, around 60 students will gather to attend a workshop on justice. The group will watch a documentary that shows how countries that have experienced massive human rights violations have addressed the legacy of the past. Then, the group will be encouraged to identify overarching themes, considering how war-time memories are conveyed through storytelling, and the role of theatre in telling these stories. After the reflection, the group will experience those narratives from various perspectives through a Mock-Trial. Furthermore, an informative discussion on the cases of alleged Liberian war criminals abroad will be held. Flomo theater is adapting Musu’s Diary Cartoons, designed by Civitas Maxima, and the GJRP, as part of their Liberian Quest for Justice campaign that seeks to inform audiences about the trials of alleged war criminals happening outside of Liberia. “The cases against alleged Liberian war criminals in the US and Europe have opened up a vibrant dialogue within our society about how we want to deal with our past. 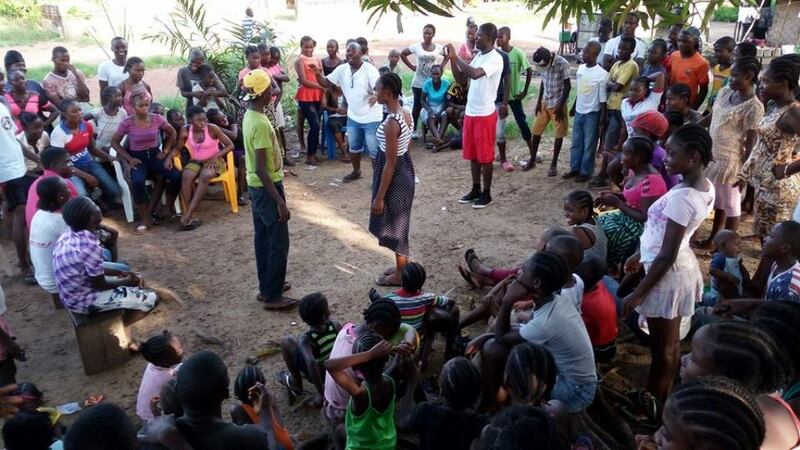 All parts of Liberian society need to partake in the discussion, including artists and the youth,” Said Hassan Bility, Director of the Global Justice and Research Project in Monrovia. On the 6th of November, Flomo Theater will present a public open rehearsal of Musu’s Diary with costumes and music. After the presentation, the audience will be asked to give feedback on the performance and reflect if the scripting of the play is representative of their reality, and if it impacted their perceptions of justice and accountability. On the 7th of November, Civitas Maxima, the Global Justice and Research Project, and the Liberian Visual Arts Academy get together with the artistic Monrovian youth during a one-day gathering. The organizations previously conducted the Cartooning for Justice Workshop, that sought to empower younger generations to use their creativity to participate in the momentous debates around justice for war-time crimes through cartooning. At the gathering, the group will debate the various dimensions of the conflict while at the same time considering the complexities of the implementation of justice mechanisms for those past crimes. Then, the group will be encouraged to artistically translate their thoughts into performance, cartoons, poetry, painting, or music. At the end of the event, every participant will present their work to esteemed guests invited to appreciate their work. In 2017, Civitas Maxima published Musu’s Diary Cartoons, that illustrates the story of a young Monrovian girl who seeks to reunite her family that was torn apart by the war. 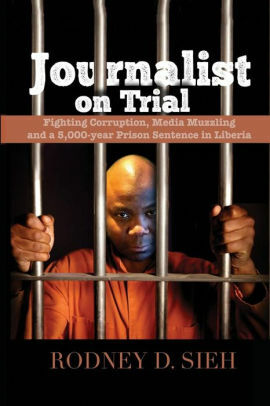 Chronicling her personal adventures while trials of alleged Liberian war criminals take place abroad (i.e. : Jungle Jabbah; Thomas Woewiyu) Musu, with her little brother Varney, embarks on a quest for justice and fights the boogeyman, a mythical figure that haunts Liberia. Flomo Theatre in cooperation with Civitas Maxima and the GJRP will adapt the cartoon’s story into a theater road-show that will travel through Liberia’s interior in 2019. “We believe that local populations have the right to accessible and unbiased information about any trials of alleged war criminals, especially those that take place in other countries.” Says, Nathaly Leduc, from Civitas Maxima.